The researchers of Harvard University have developed a force and motion measuring sensor attached to the hand that is soft, non-toxic, and wearable to humans. 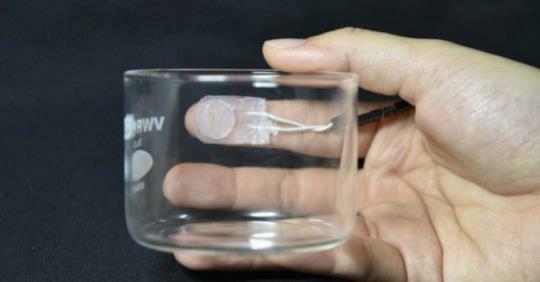 The sensor is composed of non-toxic and highly conductive liquid solution that was compared to a small drop of water. The improved liquid solution is four times more conductive than the previous biocompatible solutions resulting cleaner and low noise data. Biocompatible sensors are commonly made using sodium chloride-glycerol solution having low conductivity and is time consuming to prepare. This problem leads researchers of the Harvard University to make a solution made up of potassium iodine and glycerol that is readily available and lessens the time to prepare by 20 minutes. The Harvard Office of Technology Development has patented the innovation on biocompatible sensor and seeks to commercialize the universities’ research triumphs. The design takes in consideration of the design that is accessible to children. Rather than a bulky glove, the designed sensor made from silicon-rubber fits on the top of the finger and on the finger pad. This device gives an accurate data for modular robotic system for toddlers born prematurely which is at risk for cerebral palsy.The biocompatible sensor has different applications in various fields that may be a key component to further innovation in diagnosing sickness, therapeutics, human computer interfaces and virtual reality.